Can I be Charged with a Crime if I Carry a Knife? Many clients will come to me and ask me about the possession of knife charges in New York. The truth of the matter is that this is an issue, generally in New York City, where possession of knives is taken very seriously. New York State does not punish possession of knives per say, but there are certain types of knives which are illegal. Many pocket knives are considered to be gravity knives, under the State of New York. A gravity knife, under the laws of the State of New York, is a knife which can be opened either through the force of gravity or through the application of centrifugal force. That means if you can flick open a lock-back knife, it may be considered a gravity knife in the state of New York. Possession of a gravity knife is a crime, it’s a misdemeanor, punishable by up to one year in jail. 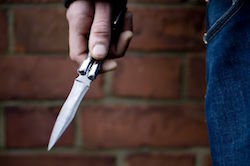 Generally, possession of a standard knife other than a gravity knife or a switchblade is not a crime. New York City has specific rules about knives over four inches and knives in plain view, and one has to be very careful if they’re going to possess a knife in New York City. Before carrying around a knife, whether for work or for some other reason, it’s important to understand the laws in your particular area, particularly in Westchester County or New York City. One might consult with an attorney before making a decision to carry a knife with them.